Since 11/05/16 Read about the Vendēe Globe action at the official race website. OceanPlanet Energy is proud to have systems aboard Hugo Boss, Great American IV, & Finistère Mer Vent. Congratulations to all competitors for a job well done! Although I’ve been twice RTW (02/03 Around alone, 04/05 Vendee) I don’t often get the chance or have the time to get on the newer boats. Although…we at OceanPlanet Energy have been able to supply both Rich Wilson and Alex Thomson with lithium batteries and other gadgets. Early last year was able to do a short trip with Rich on GA4, which was great. But of course being here in Maine we don’t often get the latest IMOCA 60’s here. 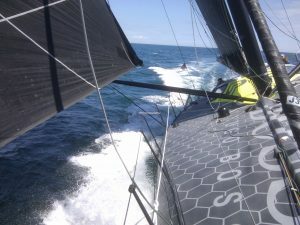 So when when I heard from from Alex Thomson, and Tom Robinson (of Osprey Technical, a great UK outfit and dealer for our new OPE-Li3 batteries) that they would be working on Hugo Boss and test sailing out of Newport last week….I had to make the 4hr drive to Newport Shipyard, starting at 4am from Woolwich, ME. It was worth it, both for the opportunity to review some systems/charging details, and of course to see the amazing new semi-foiling IMOCA 60 in action. Wow. I was in a daze much of the time, awed by the boat and equally impressed by Alex and his great ATR team. Here are some photos, which do little justice to the sensation of a 60ft boat semi-flying with 8+ feet of bow flying clear above the water, in only about 12kts of wind. Of course one worries about hitting something hard with the foils (works of art), however the speed advantage and sensation is irresistible if one wants to win the Vendee Globe. Which I think Alex has a very good chance of doing. 01/15/15 Solbian’s newest innovation is now in production. The Solbian SP ALLinONE series features the highest efficiency Sunpower cells paired with MPPT solar charge controllers and constructed into Solbian’s standard flexible backing. It is the simplest way to install a solar array. The 2 cables coming from the panel go directly to your battery. Cantact us for more information on this new product. Check out some of Bruce’s collection of videos and pictures from the Around Alone race in 2003 all the way through his Vendée Globe Race. Also, take a look at some of these Sailing Anarchy updates from Bruce. The Alex Thompson Racing team finished second in the 2016/2017 Vendee Globe starting on November 6th 2016. During the recent refit, Hugo Boss was equipped with the new OPE-Li3 marine lithium battery system.